A new book proves that the Indonesian army was responsible for the systematic slaughter of leftists in the 1965–66 genocide — and that orders came directly from the top. Jess Melvin’s new book, The Army and the Indonesian Genocide, has been rightly hailed as a breakthrough. Uncovering the actors behind the mass murder of hundreds of thousands of Indonesian leftists (as well as the country’s Chinese racial minority), Melvin punctures a hole in the prevailing story about the 1965–66 genocide. The Indonesian state has always claimed that any killing of communists or leftists was both limited and the result of spontaneous anticommunist anger among ordinary people. It was not, officials have insisted, systematic or carried out by the Army. Most existing academic scholarship, although more varied and nuanced than the official state version, has lent credence to that account. In this telling, President Sukarno, an autocratic left reformer, was attempting to balance the massive Communist Party of Indonesia (which he was partial toward) and the army (which was hostile to the Communist Party). Then things became unbalanced, and spiraled out of control. The mass killings might have been regrettable, but they were the result of Sukarno’s inability to walk this perilous tightrope. Melvin methodically lays waste to that mythology. Marshaling internal Indonesian Army documents, she shows that the killings were in fact organized by the army — and that orders came from the very top. Melvin isn’t the first to grasp the underlying dynamics of the genocide. Ironically, it’s the Right that has often been more clear-eyed. Right-wing commentators in the 1960s, such as scholar Justus van de Kroef and anticommunist journalist Arnold Brackman, understood that there was a real battle for power between the ideological outlook represented by the army and that of the Communist Party, other left groups, and Sukarno. In the academic world, recent scholarship from John Roosa (author of the 2006 book Pretext for Mass Murder) and Geoffrey Robinson (author of the 2018 book The Killing Season) has also shown that the explosion of violence was premeditated and ideologically informed. But Melvin, a scholar at Yale University, builds on this work and delivers the coup de grâce — decisively rebutting apologias for the Indonesian military. The Army and the Indonesian Genocide is a breakthrough in at least two ways. First, using internal army documents — which she discovered while conducting archival research in the Indonesian province of Aceh — Melvin is able to show, beyond any shadow of a doubt, that it was the Army High Command, seized by the anticommunist General Suharto, that initiated and supervised the mass murder, arrests, purges, and tortures of 1965-66. She provides internal documents, both from the national level (such as telegrams from army headquarters in Jakarta) and the local level (army and civilian government material) that reveal the careful, deliberate brutality of the killings. Perhaps the biggest smoking gun: documents indicating that orders to annihilate the Communist Party (PKI) came from Suharto himself. The mass killings proceeded through four organized stages: an initiation phase, a public violence phase, a phase of systematic mass killings, and a final consolidation phase, which also included purges. The bloodshed erupted following a botched conspiracy by elements in the PKI, who were seeking to replace the Army High Command with friendlier figures. It was badly organized, premature — and carried out unbeknownst to their comrades and mass supporters. The military used it as a pretext to launch a devastating counter-attack. Before the massacres were over as many as one million people laid dead, with most of the casualties occurring in late 1965 and 1966. After an initial wave of public executions, most executions were carried out at night, in secret. Combat units of the army moved from area to area, honeycombing the country with mass slaughter. Anticommunist civilian militias joined in on the killing spree. Even those who escaped with their lives didn’t get off scot free. Tens of thousands of people were thrown into ad hoc prison houses. Ultimately at least fifteen thousand were imprisoned for as many as fourteen years. The genocidal mission was a success. The PKI was cut out of the political landscape, Suharto took power, and the Indonesian left to this day is largely nonexistent. It is impossible to believe, one should add, that the United States, United Kingdom, and Australian governments were not aware of the anti-communist forces’ long-term preparations. All three governments had supplied concrete backing to right-wing army units and political groups as early as the 1950s. And all three governments hailed the violent smashing of Indonesia’s organized left in 1965-66. A second important part of Melvin’s analysis is her detailing of the infrastructure used to eradicate the PKI and seize government power. Melvin shows how military command structures previously wielded to implement martial law and military campaigns (first to oust the Dutch from colonized West Papua and then to disrupt the formation of Malaysia), combined with the territorial structure of the Indonesian Armed Forces, were appropriated to carry out killings, purges, and systematic repression. By framing the events of 1965 as the climax of a “struggle for the Indonesian state,” Melvin rebuts the old propositions of spontaneous mass anger or uncontrolled political processes. In doing so, she highlights other key events in the lead-up to the genocide. Crucially, her detailed focus on the range of forces arrayed against each other in the province of Aceh brings alive the dynamics on the ground of an ongoing political struggle — a struggle that had been evolving over a long period and was rooted in society as a whole. In Aceh, the PKI’s strength increased all through the 1950s and early 1960s. The result was extreme polarization. A chasm opened up between the PKI and the coalition of civilian elite, including Islamist figures and the Army. By 1965, the PKI and its affiliated organizations boasted close to 20 million members nationwide. Most were village peasants in what was still an overwhelmingly rural country, but plantation and urban workers also joined the party. And in 1965, membership shot further upwards. At same time, the Indonesian National Party (PNI) had also developed a left-wing program that won the allegiance of millions of members. For anticommunist civilian and military elites, this was simply too much. “The struggle for the Indonesian state” was thus a struggle in defense of their incumbency against a rising political insurgency — unarmed, legal, and open, but also outside the elite. They developed an infrastructure of counter-revolution and implemented it with unsparing brutality. In addition to the slaughter of PKI members, many of the PNI’s leading activists were killed. Artists and intellectuals associated with the PKI and PNI were imprisoned. Smaller left-wing parties, such as the Indonesia Party (Partindo) and Angkatan Komunis Muda (Acoma) also had members killed or arrested. Over the last few years, both inside and outside Indonesia, there have been several initiatives involving academics, artists, and democracy activists whose aim is to end the silence around the Indonesian genocide. Young people in Indonesia — university students in particular — are freer to read books and articles on the subject as well as access the internet. Indonesian intellectuals and activists have braved threats from right-wing groups and refused to give in to the current government’s half-heartedness in pursuing justice on the question. Melvin’s book, especially when available in Indonesian, will be a great boost to these efforts. 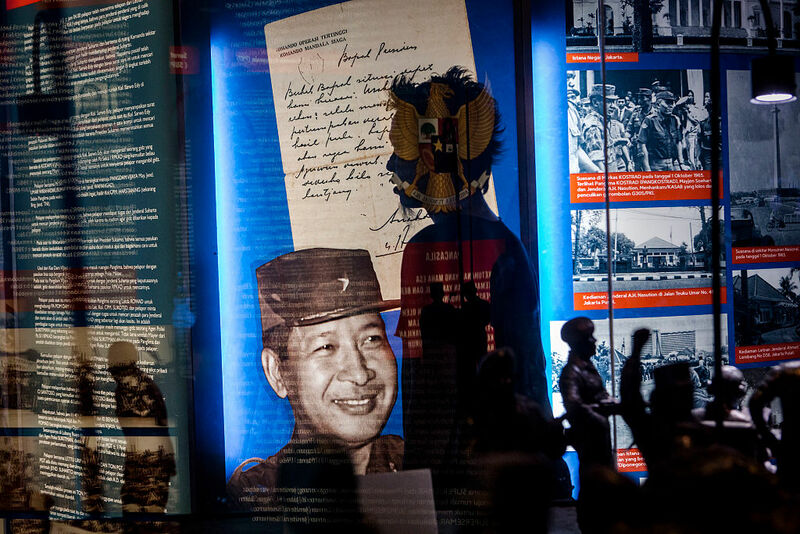 The struggle for the Indonesian state grew out of the competing forces in Indonesian society. 1965 represented the more or less total victory of one side, consolidated through nationally and centrally organized genocide, terror, purges, and repression. The increasing attempts to expose this truth, however modest, may be part of the opening shots of a revived left. And perhaps even the spark for broader social struggles. Max Lane has been a socialist activist in Australia for fifty years and is the author of Unfinished Nation: Indonesia Before and After Suharto and Catastrophe in Indonesia as well as the translator of the Buru Quartet novels of Pramoedya Ananta Toer.